A new Tax Rate editor has been added to allow for the management of more complex tax procedures. This primarily concerns special tax classes used in Australia and New Zealand. Other countries can make use of the GST tax rate. These rates can be used when invoicing directly from vintrace or when passing sales invoices through to a third-party Accounting package. Tax Rates are used in both Price Lists as a default Tax Rate and in Sales Orders as a Sales Order Item’s unique Tax Rate. Head into Winery Setup > Tax > Tax Rates. Click New tax. There must be at least one Tax Rate Component. It can be 0% for tax-free tax rates however. 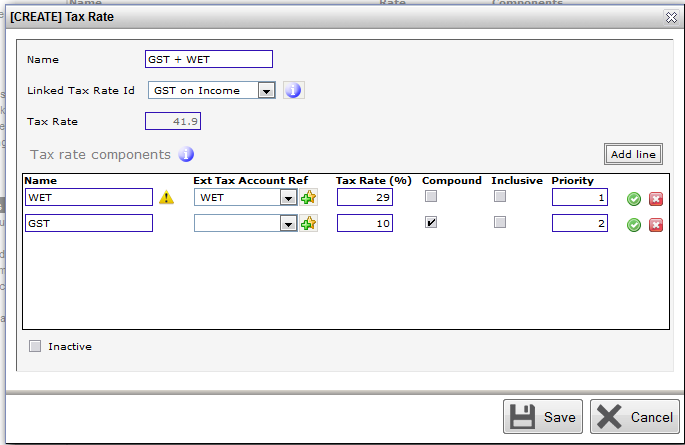 If you have chosen any of the Special Case Tax Rates, a yellow Warning icon appears such as with WET or Excise above. GST (Goods and Services tax) is an additional tax rate that can be adapted to work with other countries (US Sales tax; EU VAT, for example). 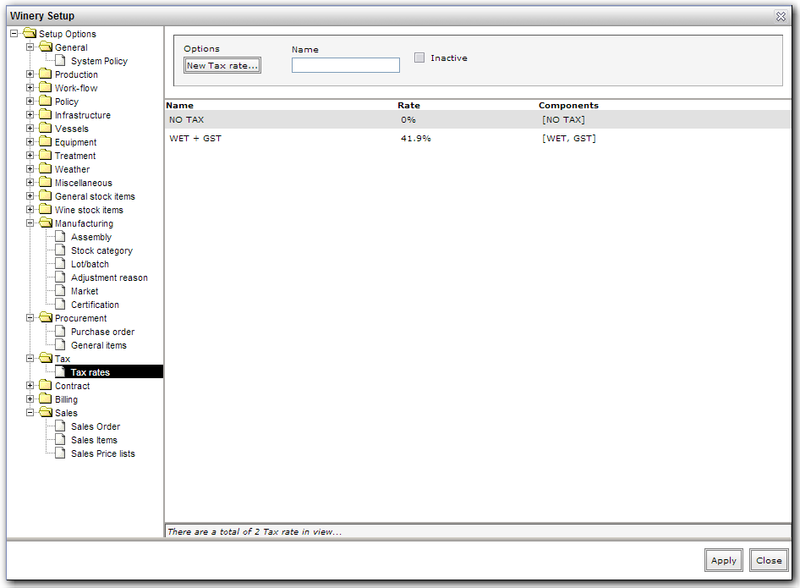 Set the Priority field to tell vintrace the order in which to calculate taxes. If you are not using a compound tax rate, Priority isn't important. If you aren't linking to an external Accounting Package, complete the form and Save. Linked Tax Rate id is the ID the tax rate will pass to External Accounting packages such as Xero. This creates the link the tax rate to the Accounting application. You will need to set up an account specifically for WET to link up with vintrace; use the Account's id/number in the Linked Tax Rate id field.